This is great and so quick in the instant pot too! It’s my go to when we have unexpected company. Mmmmmmm…..
My family is going to be very happy you shared this recipe! I was definitely on the “mashed potatoes are too much work!” bandwagon, but I will absolutely give these a try! Thank you so much for sharing!!! You have really blessed my family so much by taking so much of the stress out of my cooking that it makes me actually want to cook, lol :) Thanks again!! Oh, what?! I have made mashed potatoes many times in my crockpot, but I always have spent the time to peel & dice them before they go in to cook. You are telling me, I can just plop the whole potatoes in the crockpot to cook and then mash them from there??? You have literally opened up a whole new world now. We eat potatoes often, this is going to be fun! Seriously? I regularly take mashed potatoes to a weekly potluck dinner and with some pre-planning, I can make them in the same crock pot I take them in? Yes!!! How exciting is this?! Umm. So are we just putting the potatoes in the crock pot dry, or adding water? Sorry for the dumb q.
Yep, that’s the beauty of how simple these are! No added water, so you don’t have to drain them before mashing. Just throw them in, let them cook, then mash! Laura, I tried the crock pot baked potatoes right after you mentioned them. I thought what a time saver. well, my potatoes cooked overnight, at least 8 hrs, and still rock hard when I checked them. What did I do wrong? I had it on high. Wow, I really have no idea what could have happened! On high for 8 hours your potatoes should have been mush. Were they piping hot at the end of that time? Did you leave them to cook so that they eventually got soft? What a mystery! Laura, yes they were warm through out, but tested with a knife, poked it and it was not tender at all. I used Russets, about 5 medium is all I had in it. I cooked all day, and still rock hard. had to throw them out.. I help out a couple elderly people with meals a few times a week, so any time saver would be great.. I can’t figure out what might have gone wrong. I have only used red potatoes or yukon gold potatoes for this, so you might try that variety instead, but still, after so many hour russets should have been fine too! Yes! These are the best! Especially good on a Sunday when we have church and then minister at the nursing home. We come home so hungry to mashed potatoes in one crock pot and a roast in another. No leftovers at all on those days! Glad you are enjoying mashed potatoes again. I freeze the leftovers in meal sized amounts. They can then be reheated on the stove, in the oven (350 for +/- 30 minutes) or microwave (@50% power). I generally add a bit of milk or cream to freshen them up. Not team crockpot here with mashed potatoes, however, I do almost the exact same thing on the stove top. Start with a large stainless steel pot, add potatoes that have been cut into chunks (but not peeled) and fill with water. Boil for 30-40 minutes, or until cooked through. Drain using the lid of the pot, so no extra dish to wash. Then return to stove top, add milk, butter, sour cream, salt and pepper and mash right in the pot. Potato masher only. Using a mixer to mash potatoes gives you whipped potatoes, which are gummy and not nice. If I’m in the mood, I will add 3-4 cloves of whole garlic to the pot to boil with the potatoes. 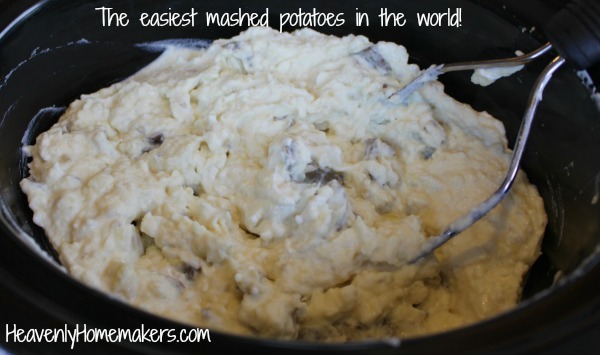 Makes the best garlic mashed potatoes. I hope your slippers look nicer than mine. :) And this is a great idea I haven’t tried. I have made mash potatoes on the stove top and then transferred to the crockpot to keep warm for a potluck so this would be much easier. Thanks a lot! I think I will try making these dairy free. We have coconut milk and vegan butter. I don’t know yet if I’ll sub out the sour cream, but I’ve made creamy mashed potatoes before without dairy. I think a little garlic powder would be a nice touch to this recipe. We have food allergies so we must work around dairy. Thanks for an easy recipe that can easily be adapted for people who can’t consume or choose not to consume dairy. 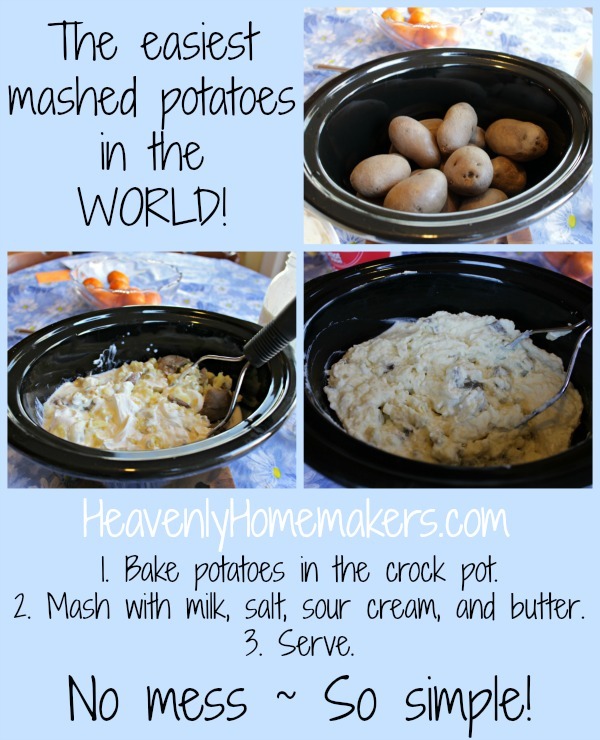 I have tried this method on two different occasions – from two different sites- and the dang taters were still solid! I had to put them on the stove and boil them until they were done!! Oh no! Have you tried adjusting the cooking time? Maybe leave them in your crock pot for another hour or two, and check them again. Every crock pot runs a bit warmer or colder, so that could change things!